After a gap in time of almost a decade the FED increased interest rates on December 16th, 2015,. The SPX has a one day bounce from the news on the day of the announcement, then it turned negative and since that time the index plumeded 13%. The markets, which were rising, due to the low-interest-rate environment, encountered a rude awakening, catching most investors off guard. Was this a surprise reaction from the market? Absolutely not. Just look back in time and compare interest rates and the stock market. When the fed starts to raise rates equities typically top out and fall. On January 29th, 2016, the Bank of Japan lowered their interest rates into negative territory, which inspired the markets, thus causing them to “rally” by 2.4%. I had written in my earlier article of how the FED steps in with a QE, or an interest rate drop whenever there is a significant fall in the SPX. During their recent policy meeting, they maintained their resolve to raise rates, albeit with caution; however, the market is skeptical, today. The FED is still far from obtaining their inflation objective while the recent GDP numbers came in at a disappointing 0.7%, for the fourth quarter. Suddenly, the economy does not look to be standing on a strong footing. What is the mood of the market? Bonds are the best indicator in which they predict what the FED is likely to do. Take a look at the chart below, of iShares Barclays 20 Year Treasury Bond Fund ETF (NYSEARCA: TLT) in order to understand the mood of the market participants. 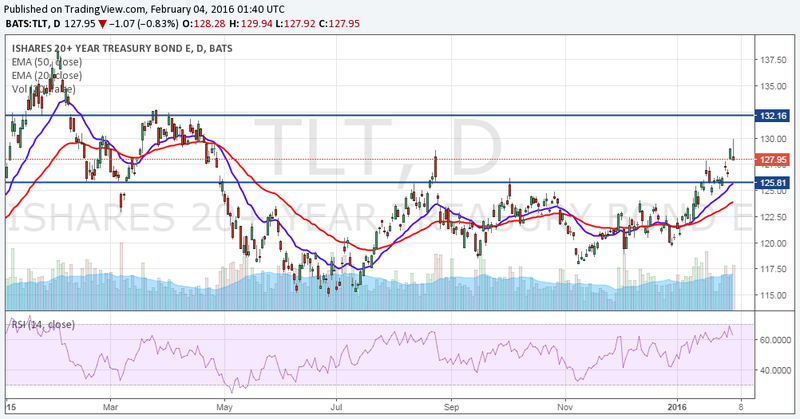 TLT should have been declining, since the FED rate hike was implemented in December. It did begin to decline after the announcement was made but that only lasted a couple days. And with the US markets “tanking”, it has since turned its’ direction around as being a safe haven and presently reflects a fresh breakout (from a 10-month range). The move has a pattern target of 132.7, which is also a resistance level from an earlier high. This means two things: 1) the equity investors are choosing the safety of the TLT rather than “buying the dip”, and 2) the market participants do not believe that the FED will raise interest rates, anytime soon. The Utilities Select Sector SPDR (NYSEARCA: XLU) is also moving in the opposite direction towards a tightening interest rate environment. The utility sector is a defensive sector which is popular among investors for its dividend yield. When interest rates rise, investors shift to the safety of the banks in order to earn a handsome return. However, despite an increase by the FED, the utility sector has also broken out of a year long consolidation. The chart pattern targets suggest a move towards 49.5. This suggests that traders are flocking to the defensive and are ignoring the commentary of the FED who are promising high-interest rates, in the future. 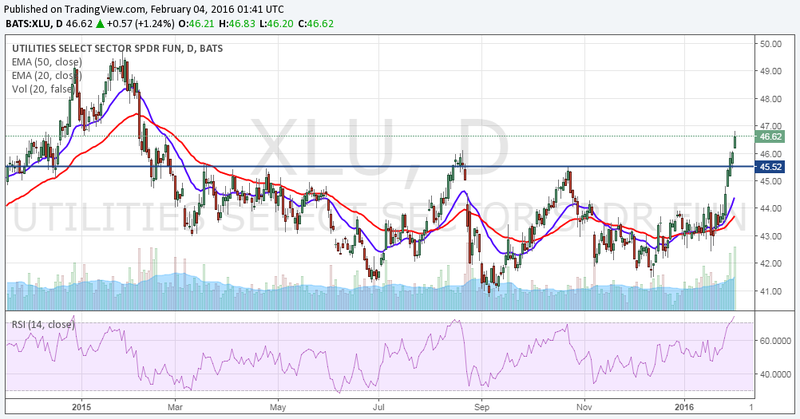 They do not believe interest rates will rise to make the yield from the XLU less attractive. What do these two charts indicate? The two charts indicate that the market believes the FED will have to quickly reverse the direction of interest rates. They may need a sharper decline, in the markets, in order to reverse; however, the market believes that they are not only going to reverse but will also come out with a QE4 in order to appease the markets. No, it can never ALWAYS work. The market participants are already questioning the effects of QE and soon, there will come a point when the market will stop reacting to QEs. This may possibly happen in 2016 when the markets enter a freefall and stop responding to the FED actions. The market will correct the excesses of the past few years with a sharp selloff. The market is indicating the forthcoming FED actions. It does not believe that the FED will be able to stick to their rate tightening cycle. Traders must be prepared to face the forthcoming slide in the US stock market. There will be only a handful of asset classes which will put up a brave front. Timing, as always, is the key. The post XLU and TLT suggest that interest rates are going down appeared first on Stock & ETF Forecasts and Trading Signals.